"Only position closing is allowed"
I am really not sure where this topic should be split as it’s a question by itself. Since this is the first time the issue occurred to me, I am posting it here. I use MT5 as my trading client. I have recently attempted to perform a BUY market execution to the pair EURCNH. However instead of propagating the execution, the request returned the following output. 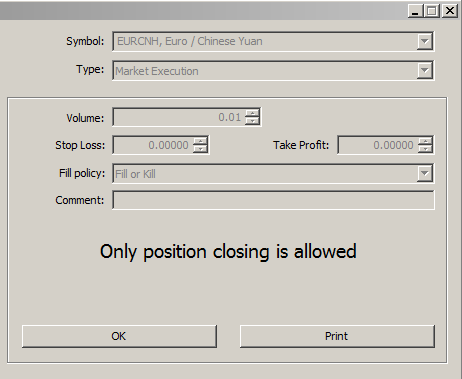 I must point out that I have never performed any market executions on EURCNH pair before (probably I opened some pending orders, but I closed them all soon after launching them) . Has anybody else experienced this before? What does it mean? What I’m interested in knowing whether this kind of message is coming from MT5 client, broker or the market itself. Are you sure you have sufficient free balance in your account to cover the margin requirement for a new position? I think your broker is your first place to ask about this - maybe they have a live chat facility on their website? I have enough free balance in my account. @klausman, did you contact your broker? What did they say? This mode could be implemented due to some restrictions from the liquidity providers for various of reasons such as lack of liquidity, recent regulation rules, economic conflicts of if the broker has decided to change its offering.